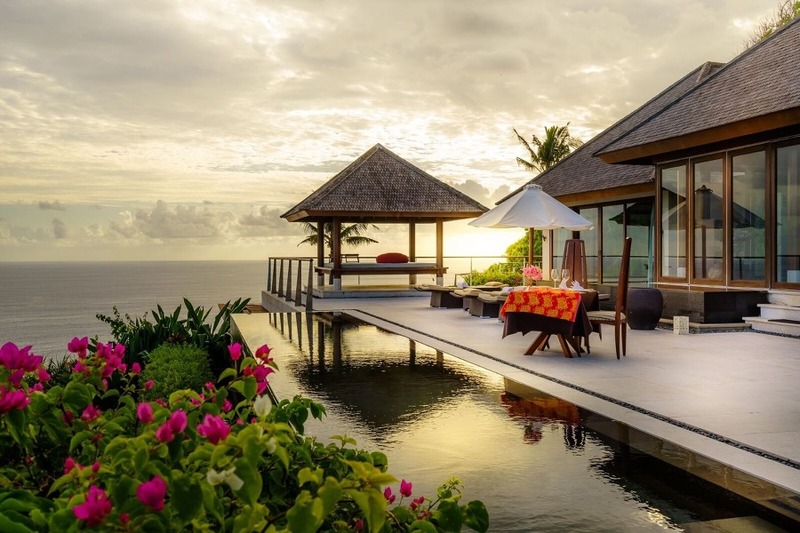 Famously known for world-class surf and a vibrant culinary scene, Bali is also home to stunning private villas with unique interior designs that will take your breath away! 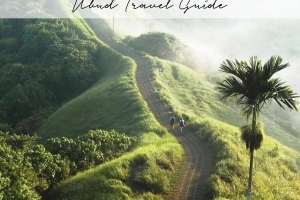 Found in spectacular settings along soaring cliff-fronts, amongst rice fields and beachside makes it pretty clear why the tropical island paradise is on the bucket list for many! Start daydreaming and enjoy The Asia Collective’s ultimate list of the Best Luxury Villas in Bali. Take note of #VillaGoals as you get lost in browsing the most spectacular properties the glistening island has to offer. Who hasn’t always dreamed of one’s very own pool-side butler while tanning and soaking in the dreamy views of your private pool? 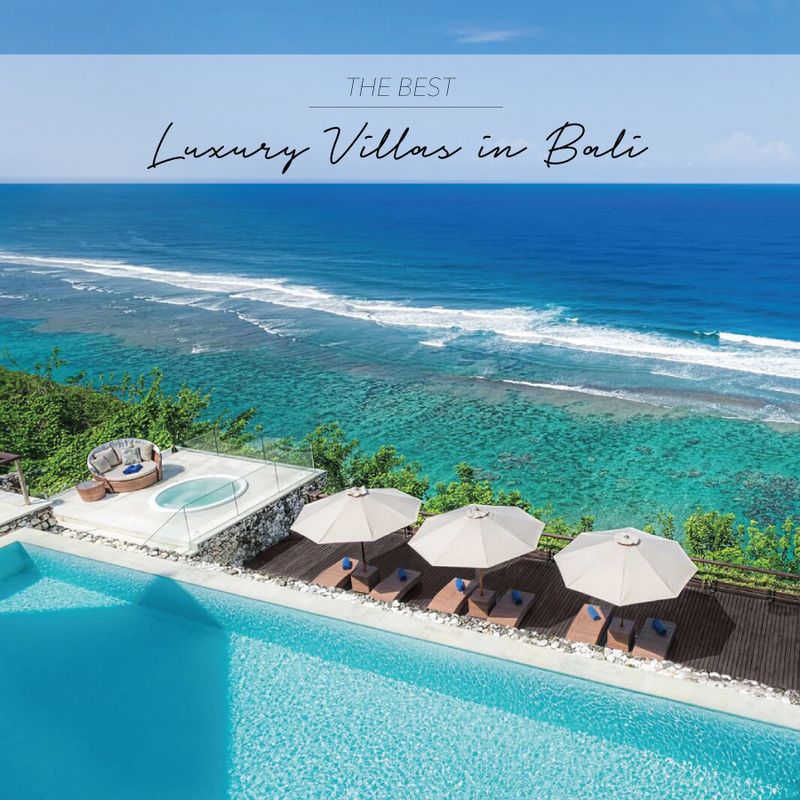 If Bali isn’t already on your holiday bucket list for this year, it definitely will be after browsing our hand-picked selection of the best luxury villas in Bali. From the seclusion of its breathtaking clifftop landscape, The Ungasan believes in making luxury simple and rewarding by creating unique guest experiences in a mind-blowing setting. 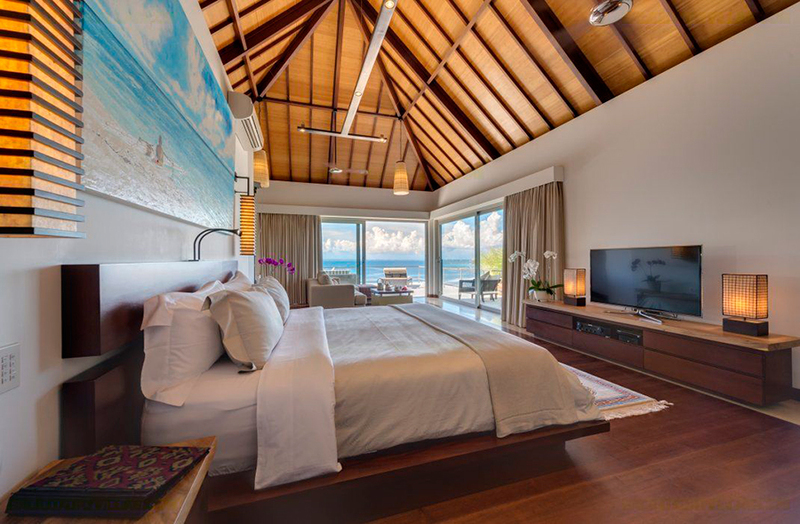 Immerse yourself in pure luxury within The Ungasan’s architecturally designed 5-bedroom villas offering exclusive private accommodation and dedicated personal service. You will also enjoy the perks of a helicopter pad and other 5-star facilities including a tennis court, putting green, gym, spa, Sundays Beach Club and acclaimed chef. Prices for The Ungasan, one of the best luxury villas in Bali start at US $550++ in low-season and US $660++ in high-season for 1-bedroom villas, and US $2,600++ in low-season and US $3,380++ in high-season for their 5-bedroom villas. Click for more details. TAC Tip: All guests of The Ungasan receive complimentary VIP access to Sundays Beach Club – one of Bali’s best beaches! Enjoy your breakfast on the beach and don’t miss out on a paddle through the glistening blue waters. 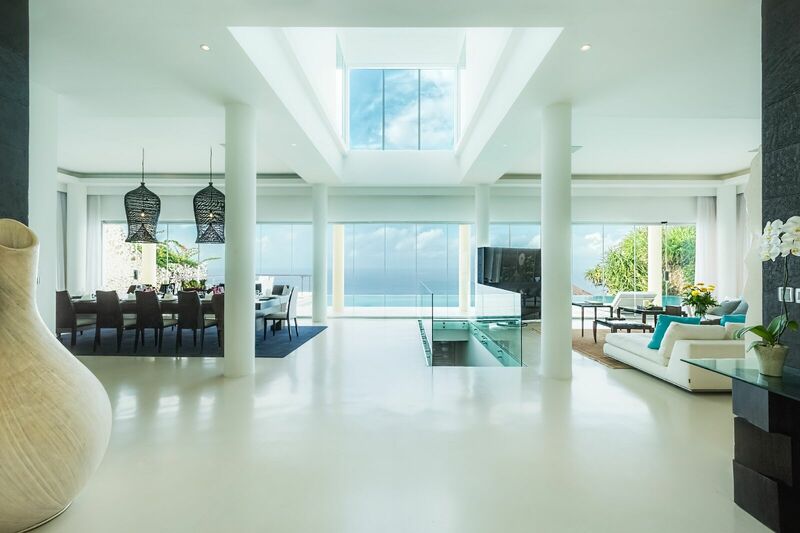 This breathtaking cliffside villa with a glamorous Ibiza-vibe and spellbinding views of the Indian Ocean will leave you in awe from the moment you step into the Grand Cliff-Front Residence’s luxury 5-bedroom mansion. 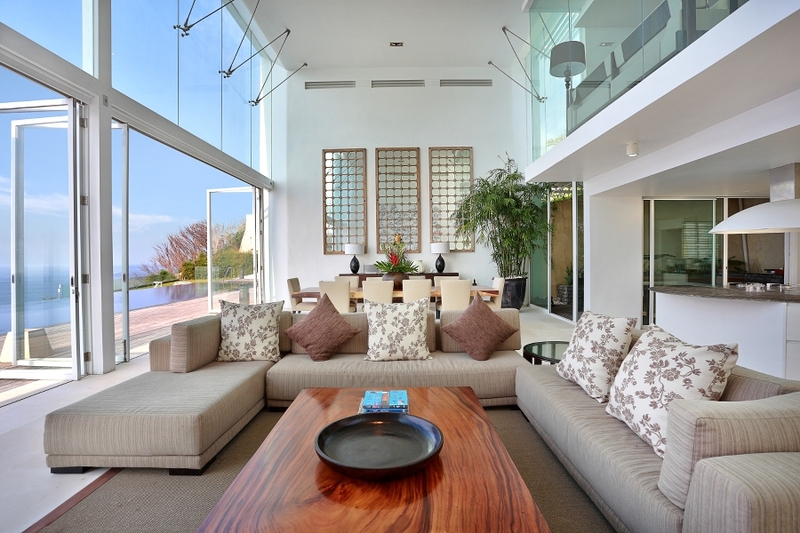 With intoxicating ocean views from its a 20-metre infinity swimming pool, cliffside jacuzzi, large living and entertaining areas with panoramic windows and all 5-bedrooms, along with dedicated personal staff, why would you leave the villa? You will also enjoy the benefits of Karma Kandara’s premium resort facilities including the famous the Di Mare restaurant, Sundays Beach Club, Karma Spa, gym and kids club. 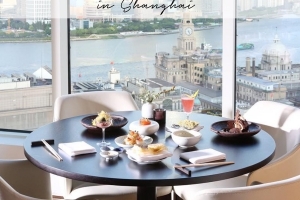 Read our detailed review of the Grand Cliff-Front Residence here. 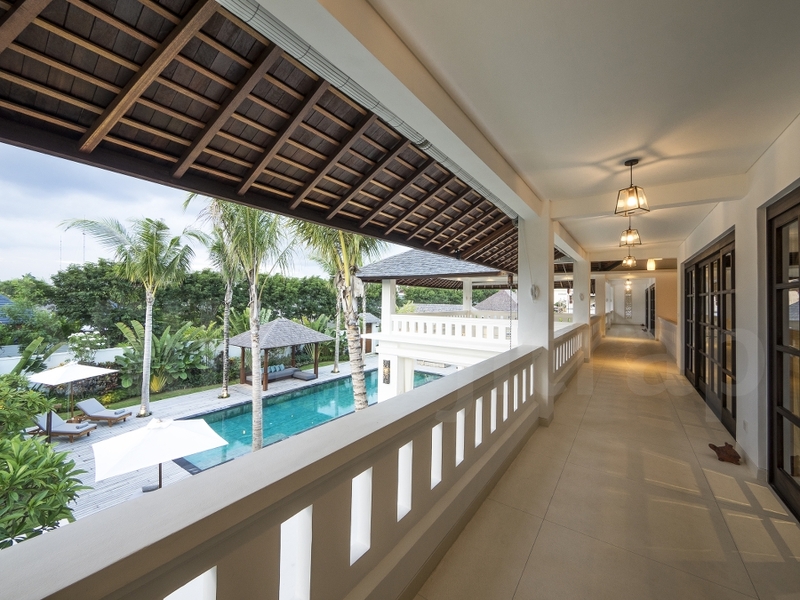 Prices for Grand Cliff-Front Residence, one of the best luxury villas in Bali start at US $1,550 per night in low-season up to US $1,950 per night in high-season. Click for more details. TAC Tip: Located on one of Bali’s most beautiful white sand beaches, enjoy complimentary cable-cabin access to Karma Beach to the tunes of international DJs at Karma Beach Club, and retreat back up to Di Mare for sunset cocktails to capture the iconic infinity pool shot. The largest private pool villa in Bali, Latitude Bali is making waves for its luxurious ambience and spectacular views. The villa pampers its guests with 6 sumptuous bedrooms suites – the master suite, pool suite and 4 quest suites – to host 12 guests in sublime luxury and privacy. Latitude Bali’s award-winning design, iconic architecture and lavish accommodation continue to rank it as one of the most outstanding private villas experience in Bali, with its 36-metre long infinity swimming pool and jacuzzi seamlessly blending into the azure horizon and aqua-blue ocean beyond. 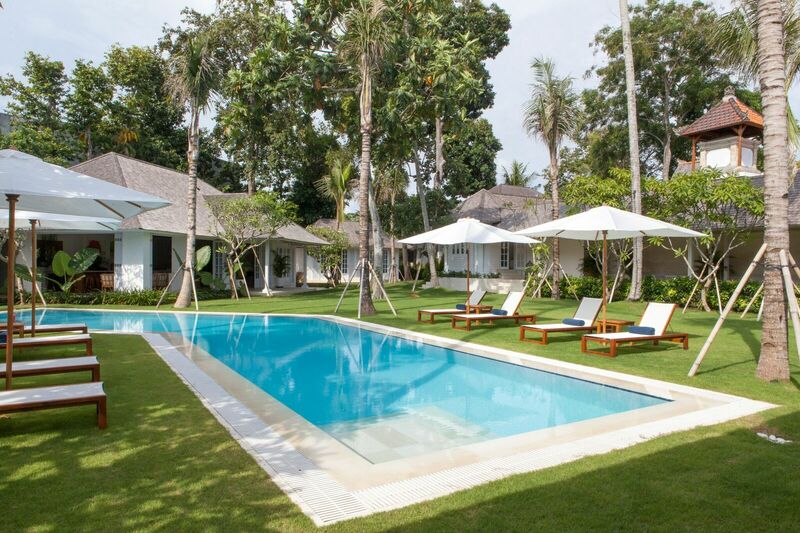 The price Latitude Bali, one of the best luxury villas in Bali is US$2,995 NET all year round. Click for more details. TAC Tip: Enjoy a round of golf on one of Latitude’s world-class golf courses or paraglide off the resort’s cliff – 80 metres above the nearby Timbis Beach! Secluded and luxurious with sweeping cliffside views and an unobstructed view of the ocean, you will be waited on by a professional private butler service from the moment you arrive until the moment you leave. With a cliff-top bar serving an extension beverage selection and fine dining facilities that can be tailored with an A La Carte for your private villa, the opulent property also offers a fully equipped fitness centre and a spectacular award-winning spa. ✓ Airport pick-up in a Toyota Vellfire or Hyundai H-1. Prices for The Edge Uluwatu, one of the best luxury villas in Bali start at US $1,300++ for 1-bedroom, US $1,800++ for 2-bedrooms, US $2,000++ for 3-bedrooms and US $8,250++ for The View 5-bedroom villa. Click for more details. TAC Tip: Enjoy stunning views of the ocean at the resort’s cliff bar while sampling some of the best wine from their in-house cellar. 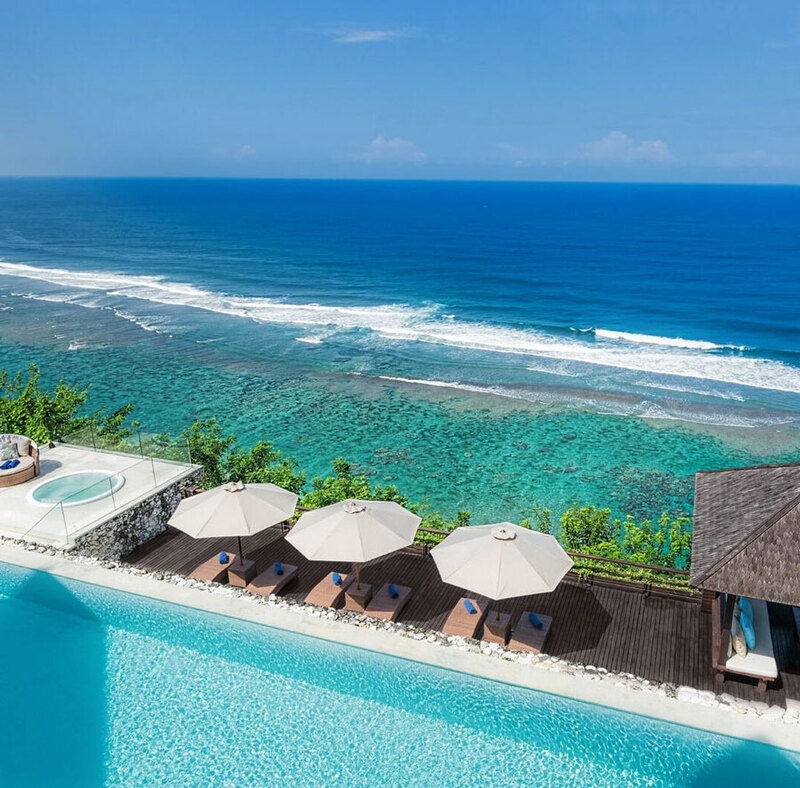 Perched high on one of Bali’s prime cliff top locations offering breath-taking views of the surf break and beaches below, the impeccable, Villa The Luxe Bali, can only be described as a “height of luxury”. The villa boasts a prestige position as one of only 3 private residences within an exclusive gated estate covering 5,000m2 of land. Featuring 3 stunning king suites each with their own private lounge quarters, stunning ocean views, private terrace, and large ensuite, a 6-person elevator to access all floors of the estate, home cinema, an infinity pool overlooking Padang Padang beach, and Swedish Sauna & Spa,Villa The Luxe is nothing short of a first-class Bali villa experience. Prices for Villa The Luxe, one of the best luxury villas in Bali start at US $790++ in low-season, US $975 in high-season and US $1,700++ in peak-season. Click for more details. 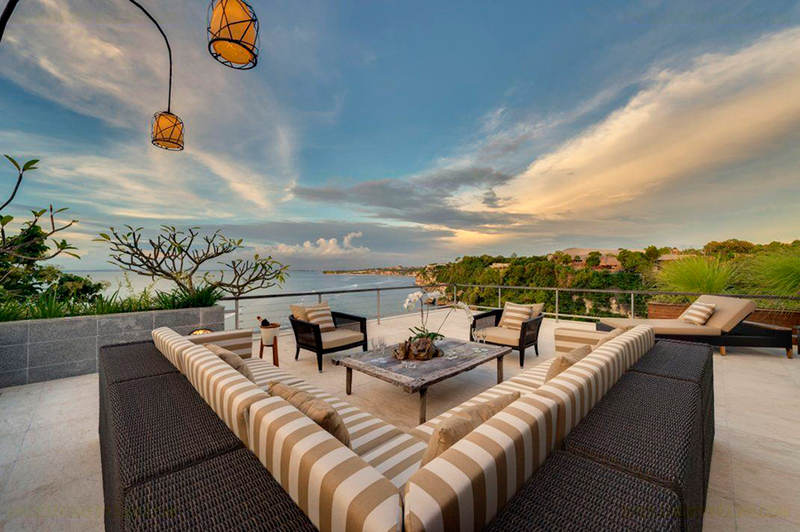 TAC Tip: Villa The Luxe is one of the only cliff top properties in Bali that has walking access to the water’s edge, enjoy an ocean swim with the ease of villa – shoreline access. 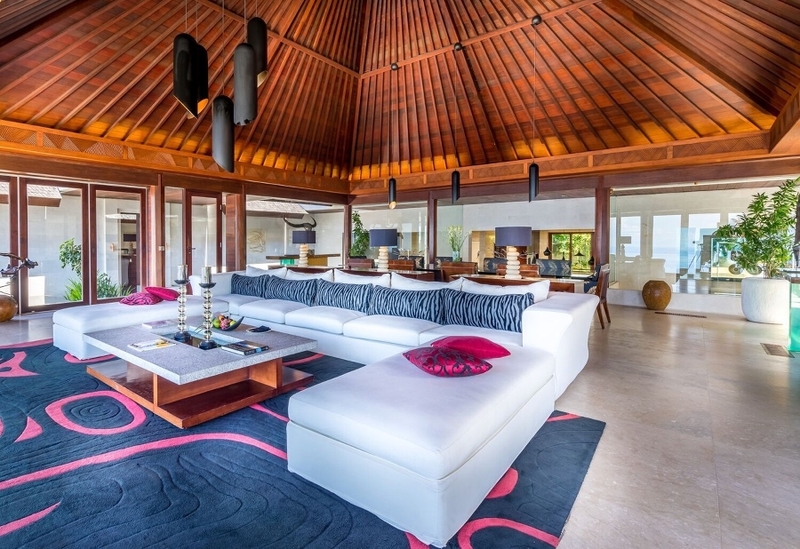 Noku Beach House is the epitome of luxury, situated on Seminyak’s exclusive beachfront. Indulge and make Noku Beach House your own private oasis, with lush tropical gardens, a seamless sea view and a private spa on-site. The villa is located perfectly in the heart of Seminyak with total beachfront access, only footsteps from the beach, shops and restaurants. Staying in at the villa is a breeze with a Gourmet Chef on site, your own private maître’d and for entertaining guests can retreat to the media room, where movies can be viewed from the plush cushioned sofa or projected for open-air viewing on the pool deck. There is ample space with 6 large bedrooms, a pool balé for dining, a stunning rooftop terrace for soirees, and the sparkling 27-metre pool. Regardless of your preference, Noku Beach house will have you feeling relaxed and right at home the moment you enter its serene premises. 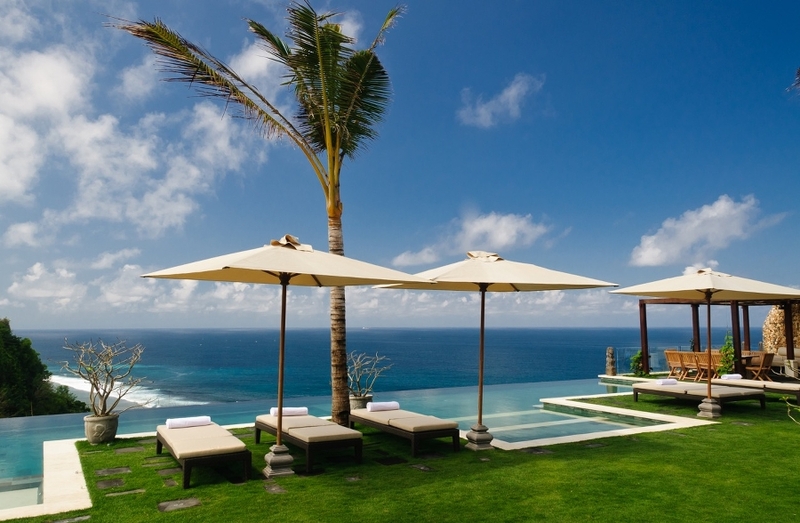 Prices for Noku Beach House, one of the best luxury villas in Bali start at US $2,750 per night night. Click for more details. 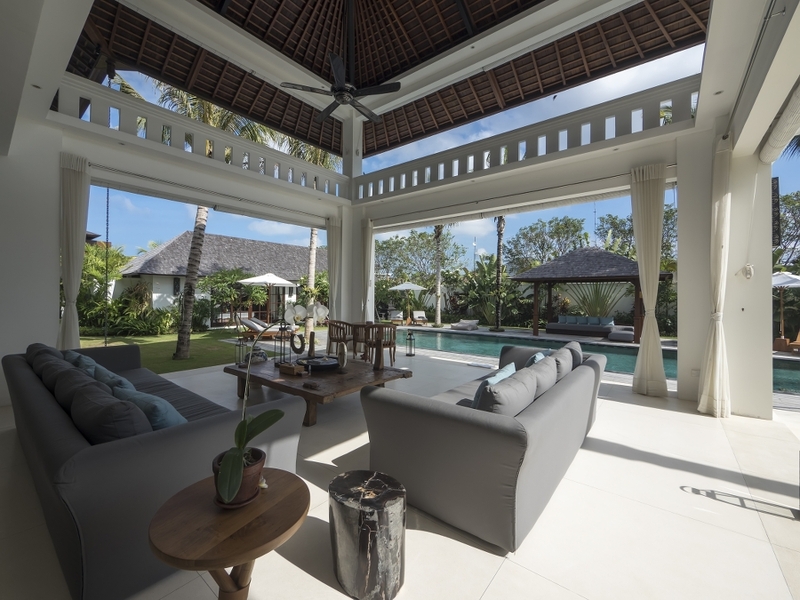 With accolades such as being listed in “The World’s Most Beautiful Homes” by Elle Decoration and being featured in Conde Nast Traveller’s “HotList Edition 2017,” this recently opened 5-bedroom architectural marvel has certainly made a name for itself in hip Berawa, the trendiest part of Canggu. With handcrafted interiors, 5 individually designed king-sized suites, a sunken living-room, swim-up bar, huge open designed kitchen, basement cinema, fully equipped gym, or its one-of-a-kind glass-bottomed pool, you’ll find jaw-dropping features at every turn. 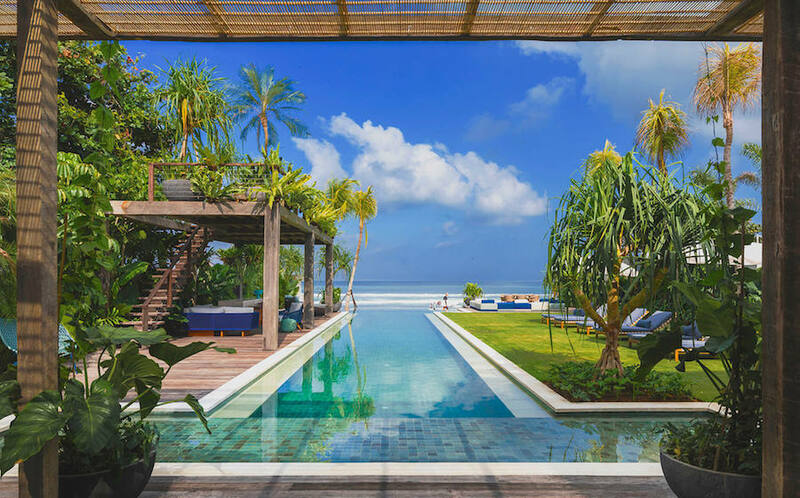 Prices for The Mandala House, one of the best luxury villas in Bali start at US $990++ in low-season, US $1,080 in medium-season, US $1,290 in high-season and US $1,550++ in peak-season. Click for more details. 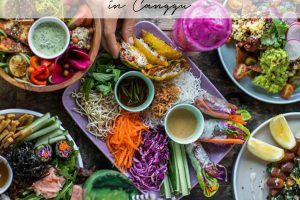 TAC Tip: Located in the trendiest part of town Berawa, you’ll be spoilt for choice from nearby Best Restaurants in Canggu & Seminyak favourites like Barbacoa and Merah Putih. 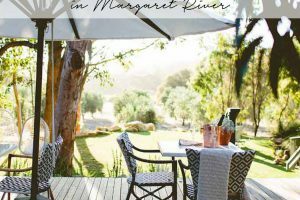 You’re also only a few minutes walk to Berawa beach. 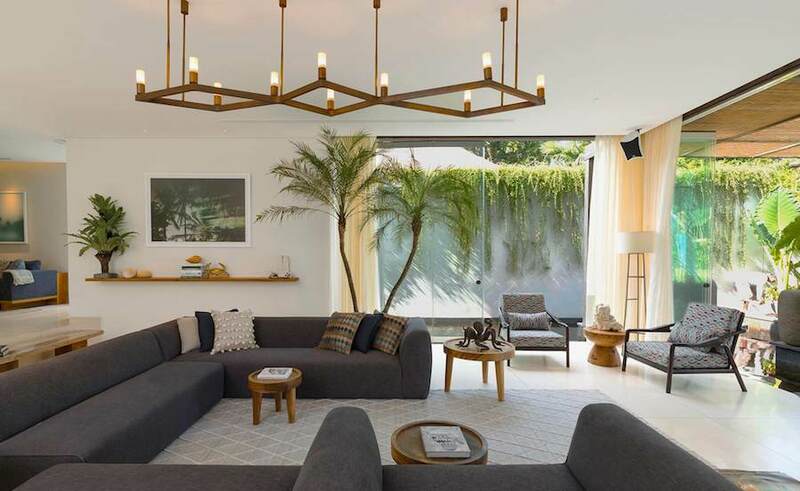 Inspired by the great houses of the Caribbean, this Seminyak 7-bedroom luxury villa is set on nearly 3/4’s of an acre in the heart of buzzing Seminyak. The beautifully decorated house, separated into 4 extensive pavilions, can be treated as self-contained villas – perfect for a large group of family or friends. Surrounded by lush tropical gardens, the large 22-metre swimming pool is the property’s centrepiece, with a big entertainment area, indoor and outdoor dining, 3 beautiful created living spaces, a library, 7-bedrooms with private ensuites, and an extensively equipped gym with the latest in cross training, running, rowing and body toning equipment. 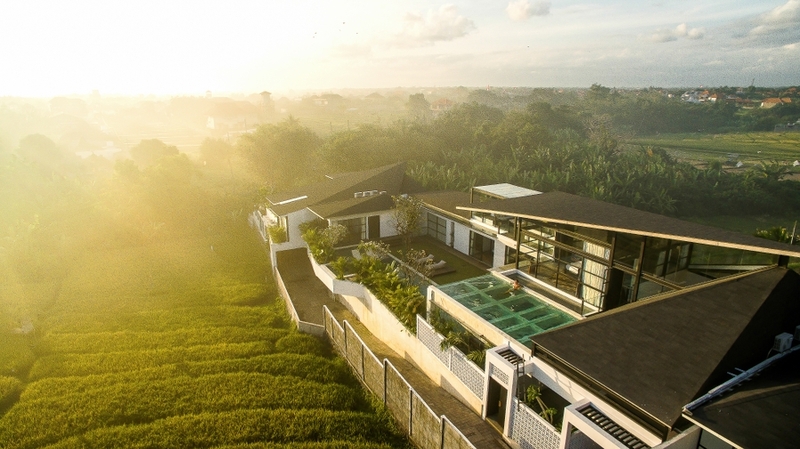 Prices for The Cotton House, one of the best luxury villas in Bali start at US $1,110 in low-season, US $1,295 in high-season and US $1,480 in peak-season. Click for more details. TAC Tip: Located in the heart of Bali’s dining capital, you are surrounded by Seminyak’s Best Restaurants like Merah Putih, Da Maria and Barbacoa. You’re also the in heart of the shopping district. 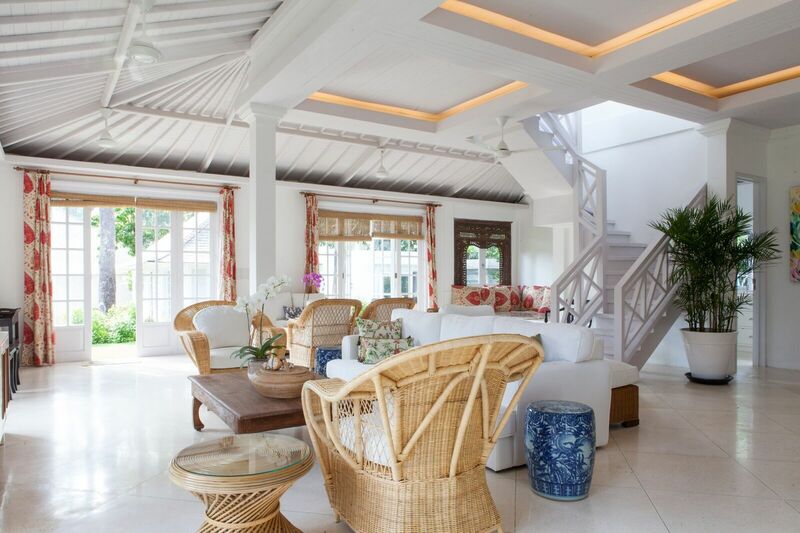 Designed by an internationally recognised architect, Villa Tjitrap is a modern mixture of Java’s old 19th century plantation tea houses and Singapore’s traditional Black and White homes. The magnificent 6-bedroom villa has high ceilings, lots of light, and beautiful gardens making you feel instantly at home, and is perfect for large groups of family and friends. Positioned in the heart of bustling Seminyak, you will feel instantly calm the minute you step inside the villa gates, with views of the coconut tree gardens and stunning infinity pool, taking you back to the feeling of the old plantations era. Prices for this Villa Tjitrap, one of the best luxury villas in Bali start at US $900 for 4-bedrooms & US $1,250 for 6-bedrooms in low-season and up to US $1,800 for 6-bedrooms in high-season. Click for more details. TAC Tip: Step outside this oasis and you’re instantly in the heart of Seminyak and nearby to some of our favourite restaurants including Kilo, Mamasan and one of Bali’s best cafes Souq Cafe. 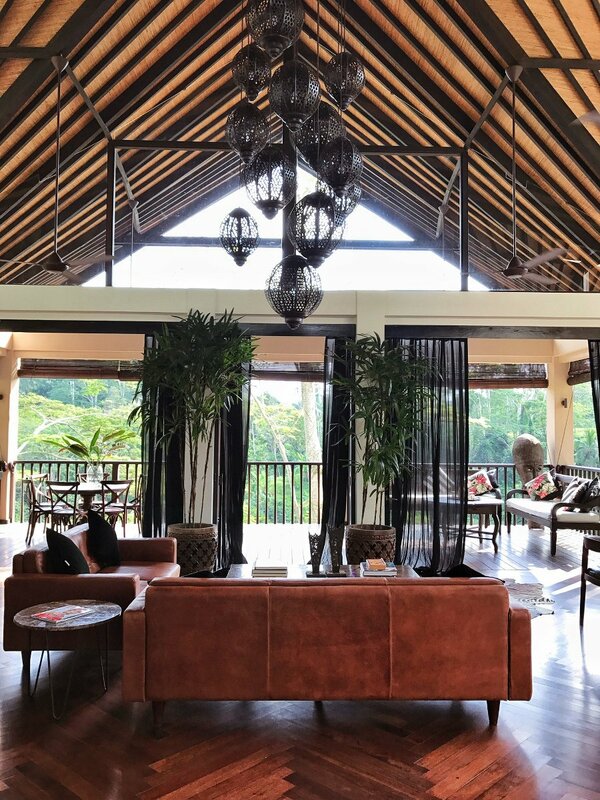 Located in a spectacular rainforest high above the sounds of Petanu River, is the 4-bedroom Villa Naga Putih (Bahasa for ‘white dragon’), 5 kilometres from Ubud. 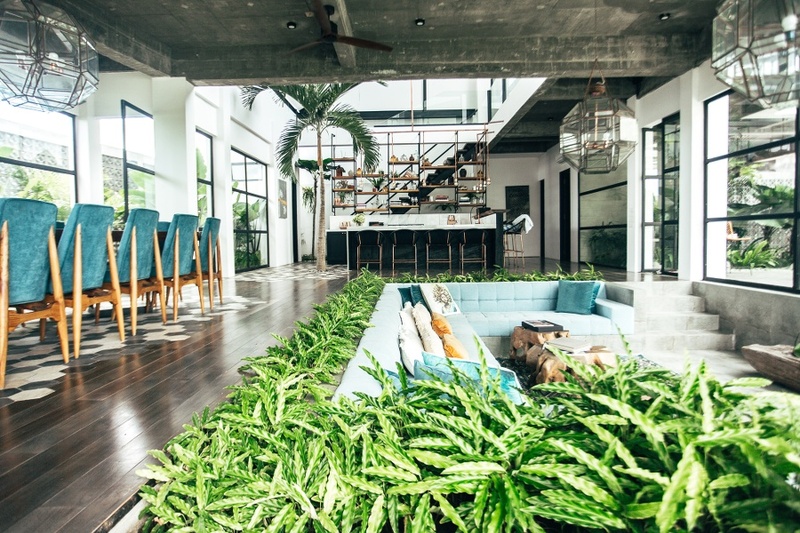 Be prepared to have your breath taken away when entering this luxury jungle home through the wide wooden doors, as you’ll be stepping into a living space which could be right out of a magazine. 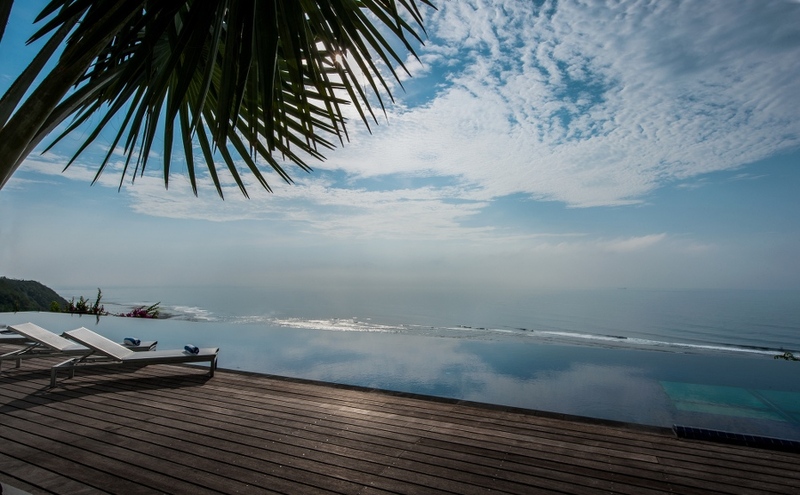 Dive into the 13-meter infinity pool or hot gazebo whilst overlooking the tropical wilderness to relax and unwind. 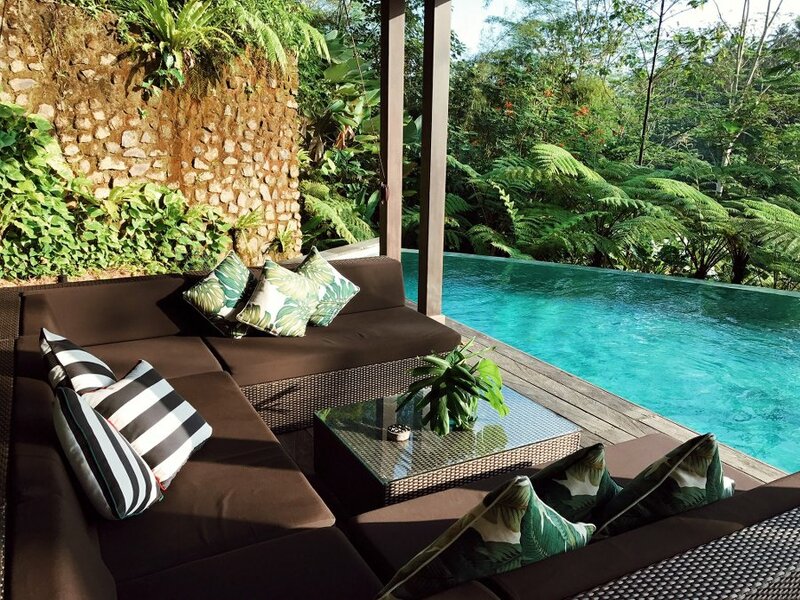 You’ll be spoilt by Villa Naga Putih’s lovely staff whilst immersing yourself in world-class luxury and comfort in the 3-storey contemporary villa, which comes with 4 elegant bedrooms, each with magnificent jungle views. You can read our detailed review of Villa Naga Putih here. Early bird prices Villa Naga Putih, one of the best luxury villas in Bali start at US $433++ per night until 31 December 2017. Click for more details. TAC Tip: Ask Villa Manager, Esa, to take you on a guided tour of the neighbouring local village, Umahanyar. The village is renowned for its carvings and you will get to see traditional Balinese compounds first hand. Book your luxury Bali villa with The Asia Collective and we’ll gift you our premium hard-cover ULTIMATE BALI CULINARY GUIDE – HUNGRY IN BALI – complimentary (worth US $50) with exclusive incentives across 60 of the island’s hottest venues – restaurants, beach clubs, cafes and spas, and a wonderful memory of your trip! Want your HUNGRY IN BALI copy now? You can shop our Ultimate Dining Guide here.